Places for the walk on Sunday (click for details) include a complimentary invitation to this launch. 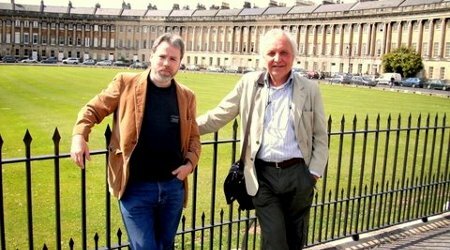 We’ve got a double-bill of exciting Regency events with David Lassman and Terence James, the writing duo behind the Regency Detective series, set in Jane Austen’s Bath. The story revolves around Jack Swann, the Darcy of detectives – a cultured and attractive gentleman, and an eligible bachelor. Haunted by the unsolved murder of his father, Swann sets himself up as unofficial consulting detective to the Bow Street Runners, but is drawn to Bath to protect his sister – and to find the “Scarred Man”, who might lead him to his father’s killer. However, he soon finds his own life threatened by Wicks, a local underworld boss whose reign of terror has the city in its grip. Join David Lassman and Terence James for what will be one of our most entertaining and eccentric bookshop events ever. To celebrate the launch of the first Regency Detective novel, we invite you to come and hear them read from the novel and discuss the secrets of their crime-writing dream team. Booksellers will be dressed in Regency costume, and may even start dancing the quadrille as the wine starts to flow. Period dress is optional for guests.